Vitamin D, also known as calciferol, is essential for strong teeth and bones. There are two major forms of vitamin D: D2 or ergocalciferol and D3 or cholecarciferol. Vitamin D can be synthesized by the body in the presence of sunlight, as opposed to being required in the diet. It is the only vitamin whose biologically active formula is a hormone. It is fat-soluble, and regulates the body’s absorption and use of the minerals calcium and phosphorus. Vitamin D is important not only to the maintenance of proper bone density, but to the many calcium-driven neurologic and cellular functions, as well as normal growth and development. It also assists the immune system by playing a part in the production of a type of white blood cell called the monocyte. White blood cells are infection fighters. 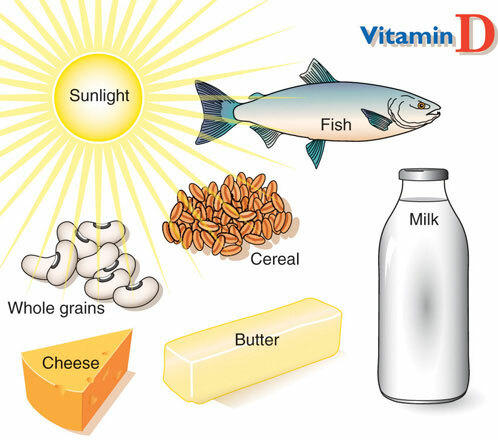 There are many chemical forms of vitamin D, which have varying amounts of biological activity. 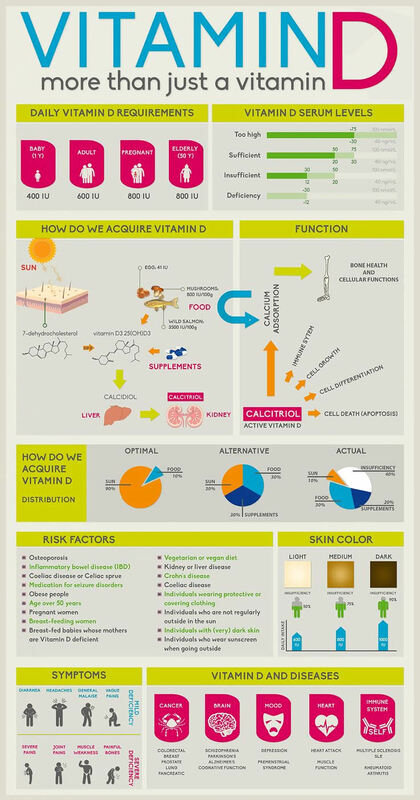 The needed amount of vitamin D is expressed as an Adequate Intake (AI) rather than an Required Daily Amount (RDA). This is due to a difficulty in quantifying the amount of the vitamin that is produced by the body with exposure to sunlight. Instead, the AI estimates the amount needed to be eaten in order to maintain normal function. It is measured in International Units (IU) and there are 40 IU in a microgram (mcg). The AI for vitamin D in the form of cholecarciferol or ergocalciferol for everyone under 50 years of age, including pregnant and lactating women, is 200 IU. It goes up to 400 IU for people 51-70 years old, and to 600 IU for those over age 70. A slightly higher dose of vitamin D, even as little as a total of 700 IU for those over age 65, can significantly reduce age-related fractures when taken with 500 mg of calcium per day. One of the major uses of vitamin D is to prevent and treat osteoporosis. This disease is essentially the result of depleted calcium, but calcium supplements alone will not prevent it since vitamin D is required to properly absorb and utilize calcium. Taking vitamin D without the calcium is also ineffective. Taking both together may actually increase bone density in postmenopausal women , who are most susceptible to bone loss and complications such as fractures. Osteomalacia and rickets are also effectively prevented and treated through adequate vitamin D supplementation. Osteomalacia refers to the softening of the bones that occurs in adults that are vitamin D deficient. Rickets is the syndrome that affect deficient children, causing bowed legs, joint deformities, and poor growth and development. Vitamin D also has a part in cancer prevention, at least for colon cancer. A deficiency increases the risk of this type of cancer, but there is no advantage to taking more than the AI level. There may also be a protective effect against breast and prostate cancer, but this is not as well established. Studies are in progress to see if it can help to treat leukemia and lymphoma. The action of at least one chemotherapeutic drug, tamoxifen, appears to be improved with small added doses of vitamin D. Tamoxifen is commonly used to treat ovarian, uterine, and breast cancers. Many older adults are deficient in vitamin D. This can affect hearing by causing poor function of the small bones in the ear that transmit sound. If this is the cause of the hearing loss, it is possible that supplementation of vitamin D can act to reverse the situation. Some metabolic diseases are responsive to treatment with specific doses and forms of vitamin D. These include Fanconi syndrome and familial hypophosphatemia, both of which result in low levels of phosphate. For these conditions, the vitamin is given in conjunction with a phosphate supplement to aid in absorption. A topical form of vitamin D is available, and can be helpful in the treatment of plaque-type psoriasis. It may also be beneficial for those with vitiligo or scleroderma. This cream, in the form of calcitriol, is not thought to affect internal calcium and phosphorus levels. Oral supplements of vitamin D are not effective for psoriasis. The cream is obtainable by prescription only. Evidence does not support the use of vitamin D to treat alcoholism, acne, arthritis, cystic fibrosis, or herpes. Exposure to sunlight is the primary method of obtaining vitamin D. In clear summer weather, approximately ten minutes per day in the sun will produce adequate amounts, even when only the face is exposed. In the winter, it may require as much as two hours. Many people don’t get that amount of winter exposure, but are able to utilize the vitamin that was stored during extra time in the sun over the summer. Sunscreen blocks the ability of the sun to produce vitamin D, but should be applied as soon as the minimum exposure requirement has passed, in order to reduce the risk of skin cancer. The chemical 7-dehydrocholesterol in the skin is converted to vitamin D3 by sunlight. Further processing by first the liver, and then the kidneys, makes D3 more biologically active. Since it is fat-soluble, extra can be stored in the liver and fatty tissues for future use. Vitamin D is naturally found in fish liver oils, butter, eggs, and fortified milk and cereals in the form of vitamin D2. Milk products are the main dietary source for most people. Other dairy products are not a good supply of vitamin D, as they are made from unfortified milk. Plant foods are also poor sources of vitamin D.
Most oral supplements of vitamin D are in the form of ergocalciferol. It is also available in topical (calcitriol or calcipotriene), intravenous (calcitriol), or intramuscular (ergocalciferol) formulations. Products designed to be given by other than oral routes are by prescription only. As with all supplements, vitamin D should be stored in a cool, dry place, away from direct light, and out of the reach of children. In adults, a mild deficiency of vitamin D may be manifested as loss of appetite and weight, difficulty sleeping, and diarrhea. A more major deficiency causes osteomalacia and muscle spasm. The bones become soft, fragile, and painful as a result of the calcium depletion. This is due to an inability to properly absorb and utilize calcium in the absence of vitamin D. In children, a severe lack of vitamin D causes rickets. 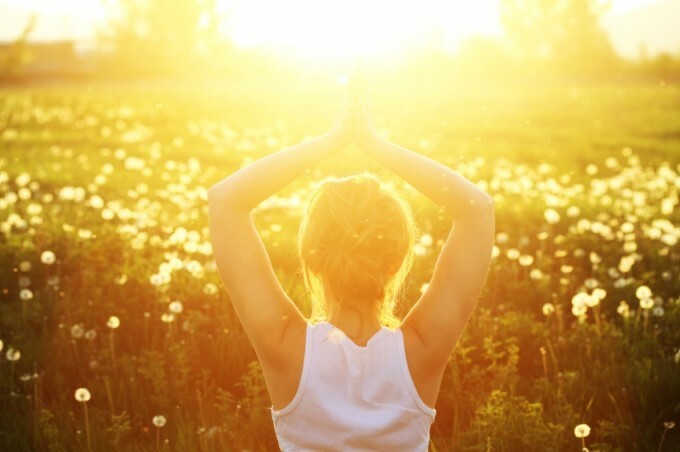 The most likely cause of vitamin D deficiency is inadequate exposure to sunlight. This can occur with people who don’t go outside much, those in areas of the world where pollution blocks ultraviolet (UV) light or where the weather prohibits spending much time outdoors. Glass filters out the rays necessary for vitamin formation, as does sunscreen. Those with dark skin may also absorb smaller amounts of the UV light necessary to effect conversion of the vitamin. In climates far to the north, the angle of the sun in winter may not allow adequate UV penetration of the atmosphere to create D3 Getting enough sun in the summer, and a good dietary source, should supply enough vitamin D to last through the winter. Vegans, or anyone who doesn’t consume dairy products in combination with not getting much sun is also at higher risk, as are the elderly, who have a decreased ability to synthesize vitamin D.
Babies are usually born with about a nine-month supply of the vitamin, but breast milk is a poor source. Those born prematurely are at an increased risk for deficiency of vitamin D and calcium, and may be prone to tetany. Infants past around nine months old who are not getting vitamin D fortified milk or adequate sun exposure are at risk of deficiency. People with certain intestinal, liver and kidney diseases may not be able to convert vitamin D3 to active forms, and may need at activated type of supplemental vitamin D.
Those taking certain medications may require supplements, including anticonvulsants, corticosteroids, or the cholesterol-lowering medications cholestyramine or colestipol. This means that people who are on medication for arthritis, asthma, allergies, autoimmune conditions, high cholesterol, epilepsy, or other seizure problems should consult with a healthcare practitioner about the advisability of taking supplemental vitamin D.
As with some other vitamins, the abuse of alcohol also has a negative effect. In the case of vitamin D, the ability to absorb and store it is diminished by chronic overuse of alcohol products. Populations with poor nutritional status may tend to be low on vitamin D, as well as other vitamins. This can be an effect of poor sun exposure, poor intake, or poor absorption. A decreased ability to absorb oral forms of vitamin D may result from cystic fibrosis or removal of portions of the digestive tract. Other groups who may need higher than average amounts of vitamin D include those who have recently had surgery, major injuries, or burns. High levels of stress and chronic wasting illnesses also tend to increase vitamin requirements. The body will not make too much vitamin D from overexposure to sun, but since vitamin D is stored in fat, toxicity from supplemental overdose is a possibility. Symptoms are largely those of hypercalcemia, and may include high blood pressure, headache, weakness, fatigue, heart arrhythmia, loss of appetite, nausea, vomiting, diarrhea, constipation, dizziness, irritability, seizures, kidney damage, poor growth, premature hardening of the arteries, and pain in the abdomen, muscles, and bones. If the toxicity progresses, itching and symptoms referable to renal disease may develop, such as thirst, frequent urination, proteinuria, and inability to concentrate urine. Overdoses during pregnancy may cause fetal abnormalities. Problems in the infant can include tetany, seizures, heart valve malformation, retinal damage, growth suppression, and mental retardation. Pregnant women should not exceed the AI, and all others over one year of age should not exceed a daily dose of 2000 IU. Infants should not exceed 1000 IU. These upper level doses should not be used except under the advice and supervision of a healthcare provider due to the potential for toxicity. Individuals with hypercalcemia, sarcoidosis, or hypoparathyroidism should not use supplemental calciferol. Those with kidney disease, arteriosclerosis, or heart disease should use ergocalciferol only with extreme caution and medical guidance. Minor side effects may include poor appetite, constipation, dry mouth, increased thirst, metallic taste, or fatigue. Other reactions, which should prompt a call to a healthcare provider, can include headache, nausea, vomiting, diarrhea, or confusion. The absorption of vitamin D is improved by calcium, choline, fats, phosphorus, and vitamins A and C. Supplements should be taken with a meal to optimize absorption. There are a number of medications that can interfere with vitamin D levels, absorption, and metabolism. Rifampin, H2 blockers, barbiturates, heparin, isoniazid, colestipol, cholestyramine, carbamazepine, phenytoin, fosphenytoin, and phenobarbital reduce serum levels of vitamin D and increase metabolism of it. Anyone who is on medication for epilepsy or another seizure disorder should check with a healthcare provider to see whether it is advisable to take supplements of vitamin D.
Overuse of mineral oil, Olestra, and stimulant laxatives may also deplete vitamin D. Osteoporosis and hypocalcemia can result from long-term use of corticosteroids. It may be necessary to take supplements of calcium and vitamin D together with this medication. The use of thiazide diuretics in conjunction with vitamin D can cause hypercalcemia in individuals with hypoparathyroidism. Concomitant use of digoxin or other cardiac glycosides with vitamin D supplements may lead to hypercalcemia and heart irregularities. The same caution should be used with herbs containing cardiac glycosides, including black hellebore, Canadian hemp, digitalis, hedge mustard, figwort, lily of the valley, motherwort, oleander, pheasant’s eye, pleurisy, squill, and strophanthus.